I recently had a baby boy and as usual (as always around here) everybody is asking when I will hold the Aqeekah ceremony. For those of you who don't know, Aqeekah is the ritual for newborns (boys and girls), where a sheep/goat/cow is slaughtered and distributed to the poor and needy. Since I've been reading free-minds for quite some time now, I can't help but ask : Is this ritual or any aspect of it permissible according to the Quran? There's chanting,hair cutting, gold/silver, feasting and slaughtering and I need to know whether all this is some old arab/semetic tradition or is there some basis in the Quran. Paradox Void is the infinitely superior. Paradox Void is an attribute of God, or any other entity it should point to, which is the same entity. Designer of all dimensions. Former of forms, shaper of shapes. According to truth. It's a cultural tradition, at least in Pakistan. You don't have to do it if you're uncomfortable with it, or you could change some things around to suit you or something. 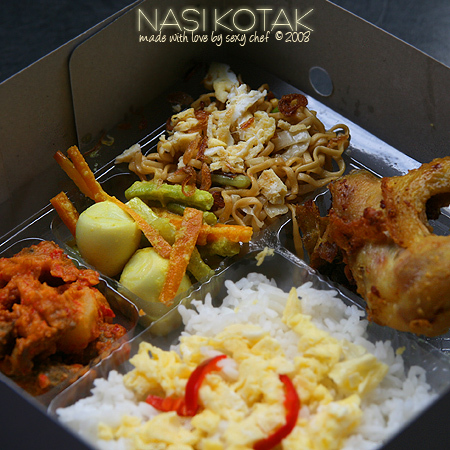 Well, a neighbor family just had it last friday, and they gave me what we call "nasi berkat" here (boxed rice, something like this) complete with goat's meat curry and as a recipient i can't say that i'm against this tradition/culture, practically speaking . (i bet the poor and needy's opinion will be similar to mine). As suggested above, maybe you can cut on the traditional 'excess' and just take the essentials or whatever is best for your family. True Love waits forever -- some just choose to fall in love sooner than some others. And the rest is by the way... nothing. Aqiqah, as far as I understand it, has no Qur'anic basis (though you find find such commandment in the Old Testament) and it is more a traditional/cultural thing. As long as you practice such tradition without thinking that God commands us to do so, it should be okay. Besides, if you use the meat to feed the poor and needy (instead of having a feast of indulgence to show off), then you'll be doing a righteous deed. Hope that helps. Everyone has a culture and there is no wrong in that. Not sure about the chanting stuff but having a get together celebrating, donating/charity, cutting hair is no big deal. The Quran is a guidance it’s open to different cultures. There’s no recommendations to do such rituals from the Quran. I too recently had a son Adam (1-11-11) and we have not had his Aqeekah, because we can't afford the 2 sheep to slaughter, so it is on hold (I live in PA, USA). I don't think it was God's intention to put such a financial burden on yourself and I too can't find it in the Qur'an. I also told my husband he shaves my baby's head he will have to deal with one ticked off mommy and Christian In-Laws who would see it as cruel and unnecessary. (He does not want to cut some hair, no he wants to SHAVE it with clippers.) I don't need him quoting a hadith either, my family loves to dance on how silly some of our beliefs are. Of course, the ones that our silly are those hadiths. Aqeekah is a cultural practice. The Quran says absolutely nothing about it. Personally if I were in your position I won't do it at all since it is an empty ritual preformed by people who follow the hadith, also it opens the door to ignorance since the people who perform this ceremony believe they will somehow bring "blessings upon the baby" when in fact it really doesn't do anything of the sort. It's just an empty ritual. Most likely a tradition passed down by pagans. In my understanding, aqeeqa slaughter is a classic example of sacrifice dedicated to other than God. In sub-Continent, aqeeqa is traditionally associated with "circumcision", another pagan ritual. It is related by Aa'ishah radhiyallahu anhaa: "During the age of perversion, the custom was that when people performed the Aqeeqah of a newly born child, they dipped a piece of cotton-wool in the blood of the sacrificed animal, and when the head of the child was shaved, it was placed on its head. (Since it was an uncivilised custom), the Apostle of Allah sallallahu alayhi wasallam remarked: 'Do not apply blood on the child's head. Apply Khalooq on its place.'" Aqeeqah was common among the Arabs during the age of ignorance too. Since, it served a useful purpose in many ways, and intrinsically was also in keeping with the spirit of Islaam, and perhaps, like the rituals of the Hajj , it was among the remaining practices of Millat-e-Ibraaheemee (the community of Prophet Ibraaheem alayhis salaam ), the holy Prophet sallallahu alayhi wasallam preserved the reality of Aqeeqah, but corrected the perverse practices that had got associated with it. inheritance and law of evidence, etc., as well, the holy Prophet sallallahu alayhi wasallam laid down that while one goat was to be sacrificed in the Aqeeqah of a female child, two should be sacrificed in the Aqeeqah of a male child, provided that one's financial condition allowed it. Umme Kurz radhiyallahu anhaa narrates that she heard the Apostle of Allah sallallahu alayhi wasallam saying about Aqeeqah: "Two goats should be sacrificed on behalf of a male child, and one on behalf of a female child, and it does not matter whether the animal was male or female." It is related by Abdullah Ibne Amr Ibne Aas radhiyallahu anhumaa that the Apostle of Allah sallallahu alayhi wasallam said: "To whom soever a child is born, and he wants to perform the sacrifice of Aqeeqah on behalf of it, he should sacrifice two goats for a boy and one goat for a girl." This Tradition shows that Aqeeqah is not obligatory, but it belongs to the category of Istihbaab, i.e., acts that are commendable in Islaam, but not binding or compulsory. In the same way, it is not necessary to sacrifice two goats for a male child. It, of course, is better to sacrifice two goats provided that one can afford it, otherwise one is enough. In the next Tradition, it is explicitly stated that the Prophet sallallahu alayhi wasallam sacrificed only one goat in the Aqeeqah ceremonies of Hasan and Husayn radhiyallahu anhumaa.